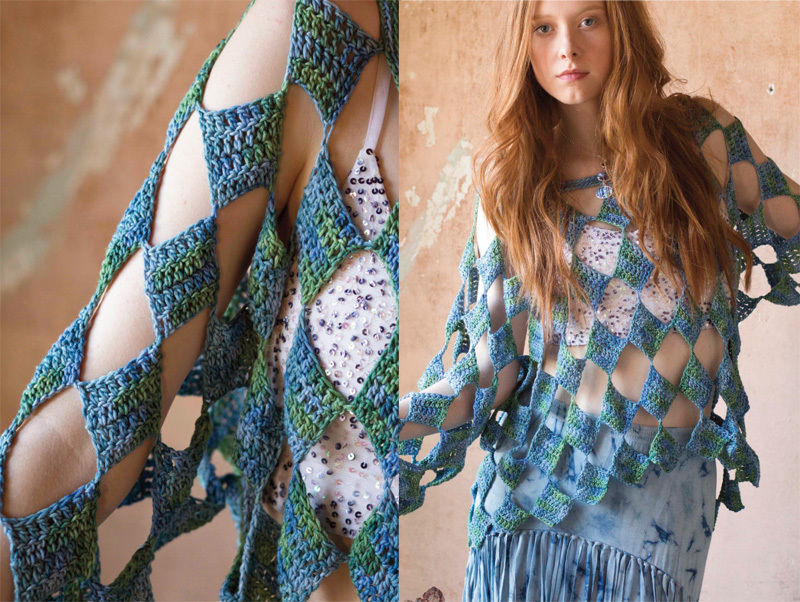 Outstanding Crochet: Hands on new issue of VogueKnitting Crochet. Hands on new issue of VogueKnitting Crochet. I must say it's the only crochet-related magazine I buy. Well, I also buy their knitting issues sometimes, though I barely knit these days, just to stay tuned with what's hot there now. I never use any patterns, but still like to go through the new issue, read articles and enjoy projects. First, what I liked in the latest issue of VogueKnitting Crochet. The highlight of this one for me is Tank Dress from designer Pat Olski. The technique is flower motifs are stitched on a mesh base using long ends. It's pretty, don't you think? But as you see heavy flowers are pulling the front down, creating very unpleasant back deformation. I would make this dress very fit, so there would be no room for that effect. And the last, but not the least: this dress in made out of wool, sleeveless mesh based dress... It doesn't make any sense to me. What season it's exactly for? Wonderful design, but has some cons. My second favorite is Mini Sheath Dress from Jeannie Chin. I have nothing against thicker yarn, but I believe one is loosing so much not willing to step into thread crochet waters. It certainly feels awkward to switch to that tiny hook at the beginning, but so worth it when you get a garment like this one as a result! Made as free-form combination of circle motifs, hair-pin lace panels and bruges lace would grab anybody's attention and make itchy experienced crocheter. Third design I admire is Ballet-neck Tee from Linda Skuja. She uses simple stitches, but combination of short rows and different colors make this design a unique one. 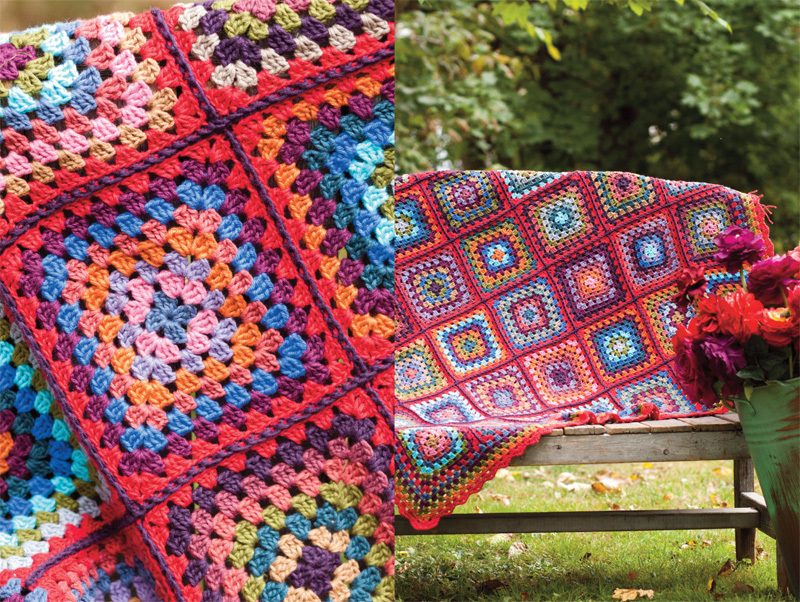 She has an association between crochet and the Seventies as smelly Granny -square afghans thrown on every couch in America. I am starting to understand that is one of the reasons why American crochet is behind the rest of the world's crochet. She is ceirtanly not the only one who thinks that way. 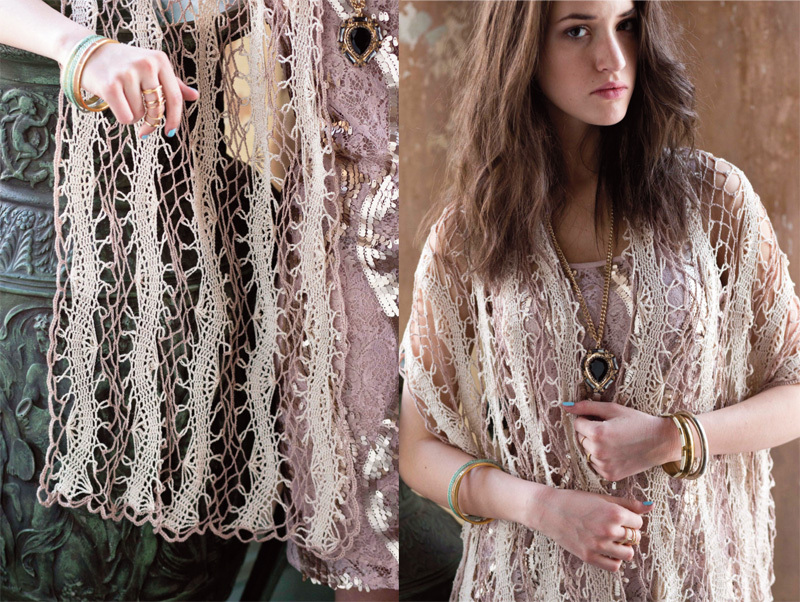 When almost every famous designer has crochet in his or her collection it's time to leave that association behind. Reading an editor's letter made me think why wouldn't they make crochet issue a monthly event? Trisha Malcolm says they get many submissions and are having a hard time to pick ones that make their way into new crochet issue. I hope it will change some day. I understand crochet is not as popular as knitting and probably would never be because it's so much harder to shape crochet stitches into the size you need, but let's not loose the hope, my crochet fellows! I hope you enjoyed my post since I barely write on my blog... I guess, fearing my broken English issue? let's leave those fears behind and step out of our comfort zones. It means different for each one of us, but for whom it's about picking up a smaller hook... do it, you wouldn't regret! Hooks up! Happy crocheting to you! Wait a minute! We forgot something! :)))) Here it is! I really, really like that sheath dress & that crocheted wrap - I actually had to go back to look at it to make sure it was actually crocheted not knitted! This is a very beautiful collection. Thank you for sharing. I own this issue of Vogue Crochet Special Collector's Issue and I am making the Ballet Neck Tee. I was disappointed that Vogue did not public a 2015 issue of Special Collector's Crochet. I wonder why. The designs were so beautiful in the three issues they published.